…and mystification by way of extraordinary verbiage. Some of us protestants are beginning to think you have got a real Christian for a Pope. Might take him seriously. Among the many true and touching expressions of respect for the tragedy of the Vatican, most have commented on the fact that the late Pope was by birth a peasant. Yet few or none, I think, traced that truth to its most interesting and even tremendous conclusion. For the truth is that the Papacy is practically the only authority in modern Europe in which it could have happened. It is the oldest, immeasurably the oldest, throne in Europe; and it is the only one that a peasant could climb. In semi-Asiatic States there are doubtless raids and usurpations. But these are of brigands rather than peasants; I speak of the pure peasant advanced for pure merit. This is the only real elective monarchy left in the world; and any peasant can still be elected to it. … Even in high and heroic republics like those of France and of Switzerland, can one say that the ruler is really the plain man in power? Now all the evidence, from foes as much as friends, attests that this really was true of the great priest who lately gave back to God the most tremendous power in the world. Those who admired him most, admired the simplicity and sanity of a peasant. Those who murmured against him most, complained of the obstinacy and reluctance of a peasant. But for that very reason it was clear that the oldest representative institution in Europe was working; when all the new ones have broken down. It is still possible to get the strong, patient, humorous type that keeps cheerfulness and charity alive among millions, alive and supreme in an official institution. As has been pointed out, with subtle power and all proper delicacy, in numberless liberal and large-minded journals, the great and good priest now dead had all the prejudices of a peasant. He had a prejudice to the effect that the mystical word ‘Yes’ should be distinguished from the equally unfathomable expression ‘No’ … The Pope never pretended to have an extraordinary intellect; but he professed to be right — and he was. All honest atheists, all honest Calvinists, all honest men who mean anything or believe anything or deny anything, will have reason to thank their stars (a heathen habit) for the peasant in that high place. 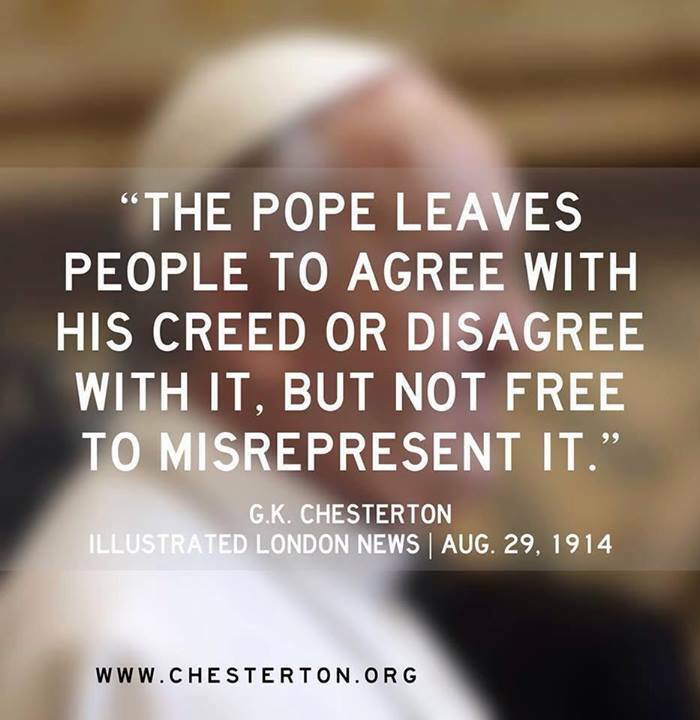 He left people to agree with his creed or disagree with it; but not free to misrepresent it. It was exactly what any peasant taken from any of our hills and plains would have said. But there was something more in him that would not have been in the ordinary peasant. For all this time he had wept for our tears; and he broke his heart for our bloodshed. I will grant that there is a clear parallel between the avuncular jocularity of Pius X and Francis, but I think the rest of the obituary only serves to highlight the unsettling nature of Francis’s career so far. As I have discussed ad nauseam (yes, I feel your pain! ), this papacy is not only beset by baffling locutionary inconsistencies, and is not only praised for sowing such confusion, but also has gone on record as defending pontifical clarity as outmoded. We have already seen how Chesterton would characterize the evangelical utility of ambiguity. Months ago I drew attention to Pietro di Marco’s critique of the “liquid message” of Pope Francis, and his metaphor struck me afresh when I saw the blurry quotation above. Perhaps on some unconscious level, even his strongest supporters realize there is a fluidity–that beloved “honey badger” unpredictability–about Pope Francis, as if he is a photograph coming more and more into focus in the bath of his tidal P.R. campaign (cf. the closing paragraphs of this post). If it takes the growing Hun schism to put a rod in his spine and take the marbles out of his mouth, so be it. Either way, may God be praised but never incriminated as the author of confusion in order to downplay the confusing authority Pope Francis often wields. In the dark days when the incongruity between Pope “Honey Badger” Francis and central assumptions of my Catholic faith nearly did me in as a convinced Catholic, I noted with whinging drollness how preposterous some of Francis’s rabidly defended howlers would have sounded coming from any other major churchman or saint worth emulating, a point which Steve Skojec demonstrated visually. Understandably, therefore, I literally “LOL’d” when I saw the blurred meme in my Facebook feed. I instantly detected in the meme the smarmy funk of what the kids call “trying too hard”. If anything the opposite seems to hold of Francis: He leaves Catholics free to misrepresent his words; but not free to disagree with them. I insist that we must be willing to admit that the current papacy, wittingly or unwittingly, obfuscates in a manner unlike any prior popes of the past few centuries. First, undoubtedly not all of the pope’s 3.6 million English-speaking followers are “lifelong Catholics”, so a little confusion “from the top” goes a long way in our already deeply dyscatechized age. Second, it is not the duty of the faithful to be vice-popes; rather, it is the grace of the pope to “confirm his brethren” in the faith. By now, however, filling in the gaps for Pope Francis has virtually become a new sacramental. Third, the soft-ultramontanist reflex, which I continue to rebuff, makes it more likely for Catholics to swallow theologically deficient statements–indeed, to swallow anything “the pope said” simply because the pope said it. Therefore, rather than strengthening one’s “lifelong Catholic” commitments, the glorification of papal ambiguity undermines them. When everyone is special, no one is; and when every papal utterance is profound, none of them is. How many of those 3.6 million tweeters bothered to look at the other translations? For the majority, given the Ultramontane Prime Directive, the message is that “If ‘the community’ is enough for ‘the pope’, then it’s enough for anybody.” Behold, the New Evangelization. Now I realize how absurd I may sound by dissecting “a single tweet,” but keep in mind that I am treating it as a variation on a theme, as only a very recent symptom of a deeper disorder. For, while the anodyne vacuity of that English-version tweet does clash with a well formed sensus catholicus, the problem is that it did not seem out of place coming from Pope Francis. Despite (or perhaps because of?) its pious obscurity, it sounded very much like something you’d expect Pope Francis to say, even without the added qualifications that showed up in other languages. Bolder still, I think we’re so far down the path of unreasoning that even if the tweet had been composed as poorly in all the languages, it would have been praised as a brilliant decree simply because “the pope said it” (standard treatment for Great Moral Leaders and Men of Action, by the way). While Catholics’ loyalty to the See of Peter is a given, our range of reflective stances has been whittled down to Botoxed affirmation or silent discontent. The tweet very well could have come from Francis’s mouth, even though it was a half-truth at best, and for such a convergence of the banal and papal to be roundly applauded by the vast majority of Catholics does not cease to disturb me. Grab a handful of Christian greeting cards from Hallmark and paste them on a photo of Pope Francis: there will be little if any semiotic gap. Words can suffer inflation just as easily as currency, and we’re on a logorrheic Autobahn which contains the palpable peril of turning the pope into a smiling noise machine, rather than, to recall Chesterton’s obituary, a mystical voice giving tireless support to the glory of truth simply and consistently spoken. The ratio of noise to signal continues to climb, and, like the Adult Voices in Charlie Brown cartoons, the more “pings” the Vatican emits, the less the Church effectively speaks. This entry was posted in Uncategorized and tagged Blurry Gospel, dyscatechesis, Puzzle Pope, soft ultramontanism, the Hun schism, the medium is the message, This isn't Denzinger, truthiness, useful idiots. Bookmark the permalink. Isn’t the glorious gavotte of the Bishop of Rome something to behold?